Free Shipping. 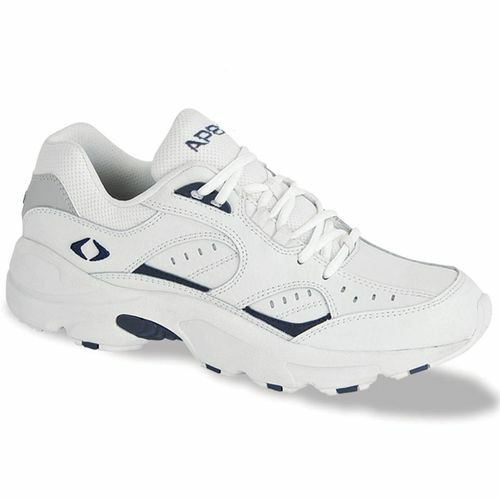 The Apex V854 Men's Lace Walker - White/Navy was designed to provide the ultimate stability and shock attenuation needed during walking and low-impact activities.Scroll down for larger, close-up picture of shoe.The Voyage collection is constructed specifically for rearfoot stability and forefoot flexibility for fluid motion while walking or running. 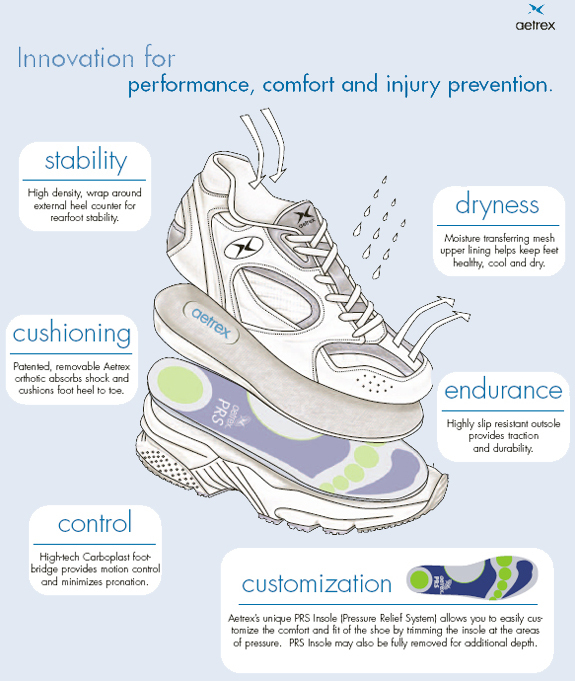 These technologically advanced athletic shoes come with patented, removable Aetrex Orthotics and PRS (Pressure Relief System) Insoles for customization of fit and comfort. Biomechanically engineered multi-density midsoles provide medial support and stability. In addition, the midsoles feature a Carboplast foot bridge that crosses the shoe for extra control.The Voyage outsole features strategically placed pods for floating independent suspension and shock attenuation. The unique Voyage last is semistraight to fit many foot types and provides a comfortable, snug heel fit for stability. Features slip lasted construction for forefoot flexibility, biomechanically engineered multi-density midsoles for medial support and stability, and a molded external heel counter for rearfoot control. The Apex V854 features hightech, leather uppers and moisture wicking open-air layered mesh linings to keep the foot healthy, cool and dry.All Voyage materials are light-weight, soft and provide unmatched comfort. -White shoe with Navy Accents. Not for me It is a nice looking shoe for the price but is not worth the money when it comes to comfort. I felt it didnt have any arch support. Did return after 2 days. Good fit Feels good and is a good fit for soemone with a wide foot.